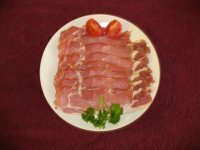 The Celtic Treasure Chest supplies Irish Bacon in slabs for this recipe, but they must be ordered in advance. Place the bacon in a large saucepan and cover with cold water. Bring the water slowly to a boil, then cover and reduce the heat to medium-low for 1 1/2 hours (about 30 minutes per pound), or until the meat is tender when pierced with a fork. Cut and core cabbage then add the cabbage to the saucepan. Cook for 15 to 20 minutes, or until the cabbage is tender, but not soggy. Transfer the slab of bacon to a serving dish, and let cool for 10 minutes before slicing. To serve, slice the meat and serve it with the cabbage, boiled potatoes and Coleman's Mustard.